The appointment of Stepan Poltorak as the head of the Defense Ministry in October 2014 marked the end of the incessant rotation of heads of the department when the ministerial portfolio changed hands four times in seven months. When ushering the new candidate, President Petro Poroshenko said his choice of Stepan Poltorak was supported by private soldiers and battalion commanders. The president remained true to his choice when changing the prime minister and the entire Cabinet. Having taken one of the most important leadership positions in a country at war, Stepan Tymofiyovych focused on the practical aspects rather than on publicity. The interviews he has given as a minister to Western and Ukrainian media can be counted on fingers. So, we have a lot of questions to ask - about strategy and tactics, the real situation at the front, external threats, the development strategy, the prospects of membership in NATO, corruption in the department, sweeping reforms in the army, etc. We will try and get comprehensive answers to these questions on Tuesday, 4 October, in the live talk show "Left Bank with Sonya Koshkina". 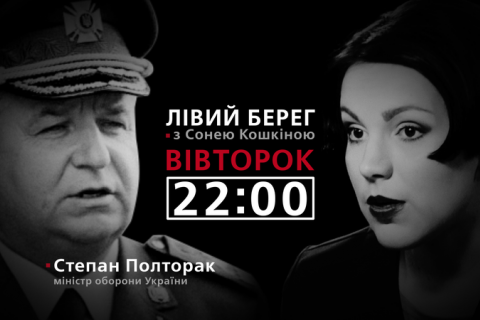 Today, on 4 October, at 22:00, on Channel 24.